The developer behind the planned transformation of Ballston Common Mall into Ballston Quarter is going heavy on "experiential" offerings, including cooking classes, live-action entertainment escape rooms, bowling, bocce, karaoke and an indoor play-and-learning center for young families. See photos. WASHINGTON — Developer Forest City Washington is going heavy on “experiential” at the completely redeveloped Ballston Common Mall, with additions that include cooking classes, live-action entertainment escape rooms on steroids, bowling, bocce, karaoke, and an indoor play-and-learning center for young families. Also in the works: a huge food hall. New and existing tenants that fall under the category of entertainment will make up a significant part of the new Ballston Quarter. Forest City says the redeveloped mall will be one of the largest entertainment hubs in the D.C. area (and an end-run around falling shopper traffic that malls are battling across the country). 5 Wits, described as a live-action entertainment venue that immerses visitors in realistic, hands-on experiences, similar to escape rooms, but with higher-quality environments, special effects and more compelling storytelling. “Visitors can play the role of action heroes dodging security lasers, tracking down a giant dragon or battling an angry pharaoh,” Forest City described the venue. 5 Wits has leased 11,500 square feet at Ballston Common and will open this fall. It will also be available for private events. 5 Wits has six other locations in New York, Massachusetts and Pennsylvania. Cookology will offer professionally taught, hands-on cooking classes for adults and kids. It has leased 5,700 square feet at Ballston Quarter, and will include five commercial kitchens. It will be Cookology’s second location, with the first being Dulles Town Center in Sterling. Nook, a modern indoor play-and-learning space for young families, is relocating its Lee Highway location in North Arlington to Ballston Quarter and has leased 3,500 square feet, divided into several different themed play areas (“nooks”). Nook will also offer classes, host birthday parties and offer a variety of family-friendly programming, from classical music concerts to parent workshops and happy hours. Punch Bowl Social has leased 25,000 square feet at Ballston Quarter and will open this fall. It will be Punch Bowl Social’s first D.C. area location. In addition to a restaurant and bar, it will include eight bowling lanes, one bocce court and three private karaoke rooms. Punch Bowl Social already has 10 locations around the country, with eight others opening this year as part of a nationwide expansion. “Although dining and retail will certainly be an important aspect of Ballston Quarter, nearly 40 percent of the property will account for experiential offerings, positioning Ballston as an exciting and fun go-to entertainment hub of the region,” said Will Voegele, Forest City’s senior vice president of development. 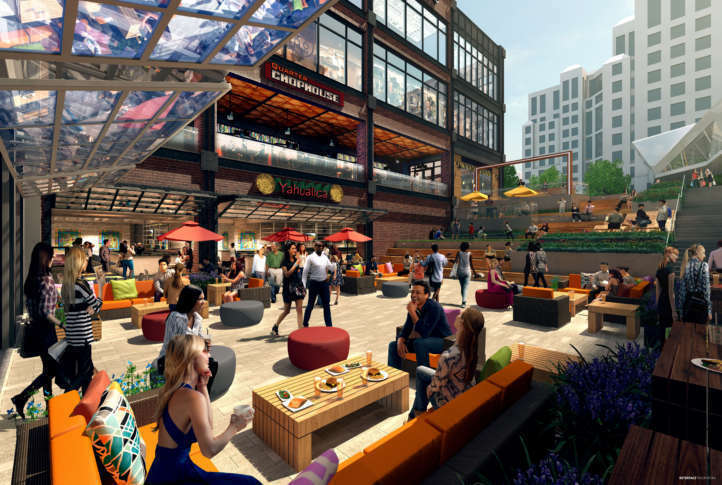 Ballston Quarter will also include Quarter Market Food Hall, a 25,000-square-foot food emporium that will be one of the largest food halls in the D.C. area with 18 food vendors. It will serve as the anchor to the Ballston Quarter project. Forest City has already announced the first nine food hall restaurants that will open this fall. Forest City’s two-year, 850,000-square-foot redevelopment of the Ballston Common Mall as Ballston Quarter includes a complete overhaul of the mall itself, in addition to a new 22-story residential building and 176,000 square feet of office space. “At Forest City, we specialize in creating mixed-use urban villages with best-in-class residences, dining, retail and entertainment, which are all critical to creating an experience that elevates how people live, work and, of course, play,” said Deborah Ratner Salzberg, president of Forest City Washington.